M Elhalal, Y Khattab, E El-Sayed, R Habib. Role of Magnetic Resonance Sialography in Diagnosis of Salivary Gland Diseases. The Internet Journal of Radiology. 2018 Volume 21 Number 1. Study the role of MR Sialography in diagnosis of salivary diseases and compare the findings with conventional sialography. The study was conducted in Misr Radiology Center on 27 patients with symptoms like swelling, pain and/or feeling of discharge from duct orifice. The study is performed between October 2012 and December 2014. Out of the 27 patients studied (17 male and 10 female), 24 have done both conventional and MR Sialography. Their ages ranged from 22 to 69 years. 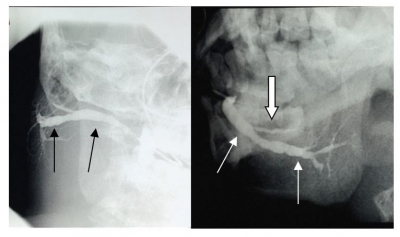 In comparison with conventional sialography, the MR Sialography revealed accuracy of 79% in showing the main duct, 92% as regarding sialolithiasis, 100% as regarding strictures, 100% as regarding sialectasis and a total accuracy of 92% in evaluation of the ductal system of the major salivary glands. MR Sialography with a heavily T2-weighted sequence found to be a promising diagnostic tool and carries the potential to replace invasive modalities like conventional sialography in patients suspected of having sialadenitis and/or sialolithiasis. It’s considered highly valid test in comparison to the conventional sialography especially in strictures, sialectasis and stones. Conventional sialography continues to be the standard technique for imaging of the duct system. In case of difficult cannulation or acute sialadenitis, MR Sialography provides an excellent alternative. Different diseases affect the salivary glands such as, inflammatory disease, autoimmune diseases and neoplastic diseases (1). Patients with lesions in the major salivary glands may present with symptoms of obstruction or inflammation, a suspected mass, or diffuse glandular enlargement (2). Imaging has an important role in making a diagnosis and in planning further management, operative or otherwise. Some diseases may overlap and the optimal methods of imaging may change depending on the presentation. Ultrasound (US), plain radiography and sialography, magnetic resonance imaging (MRI), computed tomography (CT), and nuclear scintigraphy/positron emission tomography (PET) all have a role (2). Advances in cross-sectional imaging have resulted in significantly improved evaluation of the salivary gland parenchyma (3). Currently, conventional sialography is the gold standard modality for imaging the ductal system of the parotid and submandibular glands (4). Major disadvantages of sialography may be that it requires radiation and troublesome techniques, such as cannulation and contrast medium injection. Furthermore, some patients are allergic to the contrast medium, a severe obstruction of the duct would interfere with the assessment of distal branches and overlapping cervical vertebrae may obscure the visualization of the parotid intraglandular branches (5). The earliest publications on MR Sialography were those by Lomas et al and Fischbach et al, in which single-slice techniques were used. Recently, MR Sialography has been applied as an alternative to conventional x-ray sialography. This new method may overcome all or most of the above mentioned shortcomings (5). This technique is based on the intrinsic hyperintensity of static fluid on heavily T2-weighted images. Several studies have compared MR-Sialography with conventional sialography and have demonstrated that MR-Sialography is generally as accurate as conventional sialography in detecting obstructions, stenosis, and structure of the main duct. Additionally, MR Sialography is a noninvasive technique that does not require the cannulation and injection of contrast medium and does not use ionizing radiation (4). This work aims to Study and discuss the role of MR Sialography in diagnosis of salivary diseases and compare the findings with conventional sialography. 27 patients (17 males and 10 females), ages ranging from 22 to 69 years ( mean age 44 years) with suspected salivary glands problems were enrolled in this study. 24 patients had done both conventional and MR Sialography. Two patients had done only MR Sialography because of failure of cannulation of the orifices of ducts. One patient had done only conventional sialography because of claustrophobia. MR Sialography after conventional Sialography within an interval of 3 days. Inclusion Criteria: Patients sharing some signs and symptoms as swelling of the submandibular or parotid regions, pain during mastication, feeling of a hard object in the oral cavity near the orifices and/or feeling of discharging duct artifices. The study protocol received institutional ethical committee approval, and informed consent was obtained. The patients are subjected to case history, clinical examination (inspection and palpation of parotid and submandibular regions) as well as radiographic examination (Conventional and MR Sialography). Digital fluoroscopy system of Siemens was used. One case was performed at digital subtraction system. All sialograms were obtained in the absence of acute sialadenitis. -Preliminary phase: The patients were placed in a supine position on the X-ray table. First plain films were taken to visualize any radiopaque stones before injection of contrast, position of normal anatomical structures and exposure factors. Views: Anteroposterior oblique and lateral/lateral oblique views to the mandibular/parotid region. -The filling phase: The parotid or submandibular duct orifice was identified (the parotid duct orifice opposite the upper 2nd molar tooth and the submandibular duct orifice on the side of frenulum of the tongue). For better identification of ductal orifice, the duct was stimulated by a lemon drop. Dilatation of the duct orifice is performed using a periodontal probe. Cannulation of the duct was performed using a sterile infusion set gouge 25. The tip of the infusion set needle was blunted to prevent ductal injury. Injection of water soluble contrast medium (urograffin 76%, scherring pharmaceuticals, Germany) was done using a 5 mL plastic syringe. Injection under fluoroscopic guidance was done until complete filling of the ductal structures was achieved. As soon as pain or increased pressure occurred, the injection was stopped immediately. Multiple images in multiple views were taken during injection. The main views were anteroposterior and oblique lateral views with caudal angulation of the X-ray tube. -Emptying phase: The cannula was then removed and the patient was allowed to rinse. Ten minutes after, two images (anteroposterior and oblique lateral views) were obtained to check clearance of contrast materials from the salivary ducts. The patient was advised to use an antiseptic gargle after the examination. Equipment: 1.5 Tesla scanner, superconductive magnet (Philips, Netherland). A neck coil (Philips, best, Netherland) of 20-cm external diameter and 15-cm internal diameter was used. Conventional magnetic resonance imaging using a sagittal localizer, axial fast spin-echo T1-Weighted and axial fat suppressed fast spin-echo T2-Weighted images are obtained in all patients. For MR Sialography, HASTE (half-Fourier acquisition single shot turbo spin-echo) sequence was performed. Contralateral glands and ducts were also evaluated and served as a control. The HASTE sequence (FOV 160  160 mm, slice thickness 30 mm, TR/TE 2800/460 ms, inversion time [TI] 280 ms, matrix 256  256, 180 flip angle, single slice, scan time 3 seconds) was obtained in axial and sagittal directions parallel to the submandibular/parotid duct. Approximate total time for the study was about 10 minutes including acquisition time of T1-Weighted (5 min), T2-Weighted (5 min) and HASTE sequences (3 s). The results of conventional sialography were used as the standard of reference for the evaluation of MR sialographic results. Final diagnosis was based on findings at conventional sialography and clinical follow up as well as all available clinical data. The MR Sialography images were analyzed by an experienced radiologist. The reader was blinded to clinical data and conventional sialography findings. On MR Sialography, sialolithiasis was diagnosed when rounded, ill defined, signal void lesions are seen in a hyperintense salivary duct. Strictures are diagnosed when a tapered segment of signal void was seen involving the duct along with proximal duct dilatation. Sialectasis was diagnosed when MR Sialography demonstrated hyperintense punctuate to globular areas in relation to the intraglandular ducts. The data were processed using software (SPSS, version 15; SPSS Inc., Chicago, Illinois, USA), with conventional Sialography as the reference standard. We evaluated the sensitivity, specificity, positive predictive value (PPV), negative predictive value (NPV), and accuracy of MR Sialography in comparison. The P Value is calculated. Scoring System is proposed for both conventional and MR Sialography. The normal conventional sialogram showed continuous branching of the ductal system tapering off towards the periphery of the glands, smooth contours of the main duct and ductal branches and no sialectasis. A verified ductal system, irregular or destroyed ductal contours, occlusions and sialectasias were considered pathologic findings. Score (1): No branches. Score (2): First order. Score (3): Second order branches. Score (4): Third order branches. Score (1): No stones. Score (2): One stone. Score (3): Multiple stones. Score (1): No strictures. Score (2): One stricture. Score (3): Multiple strictures. Score (1): No sialectasis. Score (2): Mild sialectasis. Score (3): Moderate sialectasis. Out of the 27 patients studied (17 male and 10 female), 24 patients have done both conventional sialography and MR Sialography and were included in the study. Main duct MR Sialography failed to reveal the main duct in 29.28% (7 patients) of cases while conventional sialography failure rate was only 8.3% (2 patients). Table 1 shows statistically significant difference between both methods by using Chi-square test in favor of conventional sialography. Stones were found in 7 patients (29.2%) in MR Sialography versus 9 patients (37.5%) in conventional sialography. Table 2 shows no statistically significant difference between both methods by using paired test. MR Sialography shows sensitivity of 77%. No false negative results were obtained in diagnosis of stones resulting in specificity of 100% and a diagnostic accuracy of 79%. Strictures were found in 8 patients (33.3%) in MR Sialography and in 6 patients (25%) in conventional sialography. Table 3 shows no statistically significant difference between both methods by using paired test. MR Sialography shows sensitivity and specificity of 100% and 100% in diagnosis of strictures. Sialectasis was found in 15 cases (62.5%) in MR Sialography and in 8 cases (33.3%) in conventional sialography. Table 4 shows no statistically significant difference between both methods by using paired test. MR Sialography shows sensitivity and specificity of 100% and 100%. Table 5 showed that MR is considered highly valid test in comparison to the conventional method especially in strictures and sialectasis. MR Sialography clearly showed the presence of duct obstruction and proximal duct dilatation in all patients with strictures (8 patients). On conventional sialography, opacification of proximal part of main duct is considered to be good in 6 patients and poor or not achieved in 2 patients. When direct comparison is made with conventional sialography, MR Sialography correctly classified the level of stricture in all patients with strictures. Sialolith in the proximal main duct of Right submandibular gland. a. Left, Plain X ray lateral oblique view showing a radiopaque calculus at submandibular region. Right, right lateral view of conventional sialogram showing cessation of contrast in the proximal main submandibular duct. b. (left) coronal and (right) sagittal MR sialogram of the right submandibular gland reveal the mild dilatation with beading of the intra glandular branches with the stone (arrow) in the proximal part of the right submandibular duct. Single stone at the distal end of right Wharton’s duct with mild sialadenitis of the right Submandibular gland. (Left) coronal and (Right) axial MR sialogram of the right submandibular gland reveal the Moderate dilatation of the proximal duct (arrow) to a signal void at distal end that represents a stone (thick arrows). Mild sialadenitis with post-inflammatory enlargement of the right Parotid gland (Left) sagittal and (Right) axial MR sialogram of the right parotid gland reveal beaded right main parotid duct and its first order branches(arrows) with punctate filling of its second order branches(thick arrows). sialodochitis of right stensen’s duct with punctate sialectasis intraglandular Right parotid MR sialogram (Negative image to the right) revealed the mild dilatation of the right main duct with beading that extends up to a stricture at the distal end of the duct(thick arrow). (The beading is more obvious than in the conventional images). Right accessory parotid duct is noted (arrow head). Puctate Sialectasis (arrow). Sialography can be defined as the radiographic demonstration of the major salivary glands by introducing a radiopaque contrast medium into their ductal system. It was first mentioned by Carpy in 1902 and first described by Arcelin in 1921 for the investigation of the submandibular duct. MR Sialography is an excellent example of MR Hydrography technique, using extremely long TR and TE times to highlight fluid and suppress other surrounding tissue signals (7). The MR sialographic technique obtains projection images of the ductal system similar to conventional sialography. MR Sialography has evolved since it was first described by Lomas et al. (1996). MR Sialography has been performed by various investigations using different sequences (8). 1997, Fischbach et al. obtained a single slab with a heavily T2-weighted fast SE sequence. 1998, Ohbayashi et al. used a gradient and spin-echo (GRASE) sequence. 1999, Varghese et al. used a heavily two dimensional (2D) fast spin-echo pulse sequence. 2000, Jager et al. used a rapid acquisition with relaxation enhancement (RARE) sequence and a three- dimensional (3D) constructive interference in steady-state (CISS) sequence (9,10,11,12). One of the chief disadvantages in MR sialography used in those studies previously mentioned was the long imaging time (three to six minutes) due to using multi-slice sequences along with maximum intensity projection (MIP) reconstruction. The introduction of single shot turbo spin-echo (SSTSE) sequences into MR Sialography greatly shortens the imaging time. The applied SSTSE allowed fast and sufficient visualization of the excretory ducts of the main salivary glands, and no elaborate post processing is required (13). In (2005), Takagi et al. established a fast and high-resolution MR sialographic technique (HR. MRS) by applying single section SSTSE sequence using a small surface coil. In (2006), Morimoto et al., performed dynamic MR sialography using citric acid stimulation. In 2008, Hugill et al. (2008) investigate the effect of a sialogogue and passive ductal occlusion pad adjacent to the parotid duct orifice. Gadodia et al., (2010) and (2011) used a combination between 3D CISS technique and HASTE technique (5, 8, 14, 15). The advantages of MR hydrography are its non-invasive nature and the fact that contrast media, radiation exposure and experienced operator are not required (8). The present study is designed to evaluate the role of MR Sialography in the diagnosis of salivary gland diseases. In our study we begin by doing conventional sialography which was followed by MR Sialography within period not more than 3 days. As regard conventional sialography, a water soluble contrast medium (Urograffin 76%, Scherring pharmaceuticals, Germany) is selected for use where water soluble media are less viscous which permits the gland to be filled with less pressure and less discomfort to the patient and is absorbed quickly from tissues, also have been found to cause fewer adverse reactions as reported by Kalk et al. (2001) (16). Moreover, herein, the conventional sialographic examination is carried out under fluoroscopy to monitor the injection process and avoid the creation of a false ductal tract. MR Sialography is done using the HASTE sequence. A single section with a thick imaging slab (3 cm) is applied to obtain a two dimensional projection image of the curvilinear fluid-filled duct similar to conventional projection radiographs using X-rays. Axial fast spin-echo T1-weighted and fat suppressed fast spin echo T2-weighted sequences are obtained to delineate size, signal intensity of glandular permchyma. In our study, MR Sialography failed to clearly reveal the salivary glands main ducts in 7 patients (29% of cases) while this occurred in only two patients (8%) with conventional sialography. As regard ductal branches, MR Sialography revealed up to third order branches in one case (4.2%). While conventional sialography revealed up to third order branches in ten cases (41.7%). The lesser accuracy of MR Sialography in clear visualization of main duct and its minor branches may be due to the nonuse of sialogogue in our study. This is supported by the studies done by Habermann et al. (2005) and Petridis et al. (2007), who stated that results of MR Sialography were improved and the ductal structures were delineated more clearly after stimulation with a sialogogue (17,18). Sialolithiasis is the most common major salivary gland disease. Sensitivity and specificity of detection of calculi by MR Sialography in our study was 77% and 100%, respectively. This result matches with results obtained by Gadodia et al. (2010) and Kalinowski et al. (2002) (8,20). In MR imaging the diagnosis of sialolithiasis is based on indirect signs (i.e., areas of complete obstruction with signal void and prestenotic dilatation). Therefore, small non-obstructing duct stones will be missed in most cases. Specially, sialoliths close to the orifice or located in smaller intraglandular ducts are difficult to diagnose with MR Sialography. However, it is questionable whether non-obstructing stones cause clinical symptoms. The major drawback of MR imaging is its insensitivity to calcium detection. Varghese et al. (1999) stated that MR Sialography when combined with conventional radiography will have a higher accuracy. Also, administration of sialogogue may lead to pooling of saliva around stones, thus making them more obvious on MR Sialography (11). As regard strictures and sialectasis MR Sialography shows sensitivity and specificity of 100% and 100%, respectively for each item. These results are in accordance to studies done by Varghese et al. (1999); Kalinowski et al. (2002) and Gadodia et al. (2010) (8,11,19). 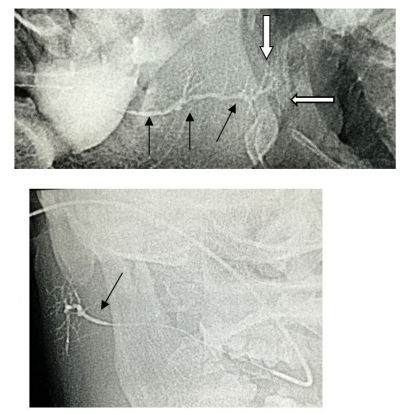 MR Sialography proved to be particularly useful in those patients with tight strictures where opacification of the stricture and the proximal dilated duct was difficult on conventional sialography. Four glands showed hyperintensity on T2-weighted images suggestive of sialadenitis. 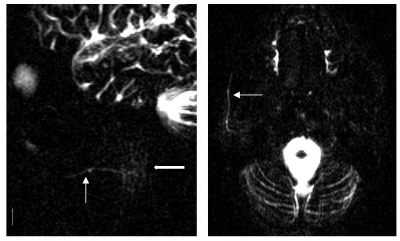 MRI delineated signal intensity and size of the glands in addition to ductal system. This information is not provided by conventional sialography, and contributes to the diagnosis and is important from a surgeon’s view. Although our experience with pathologic findings is still limited to small patient population, MR Sialography seems to be a promising non-invasive technique for the detection of ductal abnormality in major salivary glands. The most obvious advantage is the fact that images can be obtained without use of ionizing radiation, as well as its non-invasiveness. No contrast material has to be injected and images can be obtained with short acquisition times of less than 10 seconds. Contralateral salivary glands can be easily visualized without further positioning of the patient and can serve as a control. Images can be obtained with use of standard protocols and do not require an experienced examiner. 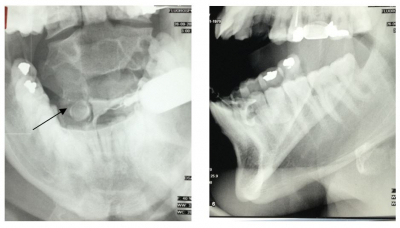 Contraindications for conventional sialography such as acute sialadenitis are not contraindications for MR Sialography. Ductal structures can be also visualized in cases of complete obstruction of ductal system. Also, additional cross sectional images of the glandular parenchyma can be obtained by using conventional T1 and T2- weighted sequences. Furthermore, MR Sialography has an excellent sensitivity for visualization of edema in the salivary parenchyma which is more difficult to diagnose with CT. Limitations of the MR sialographic technique include low spatial resolution due to the extremely short acquisition time, which prevents detection of subtle and moderate changes in secondary and tertiary branching ducts in chronic sialadenitis. MR Sialography is also inferior to conventional sialography in the diagnosis of chronic inflammatory changes. The limited spatial resolution of static images makes it very difficult to distinguish between complete and partial obstruction of the ductal system. Therefore, in cases of suspected ductal obstructions, additional cross sectional images through the Stensen or Wharton duct are indicated. 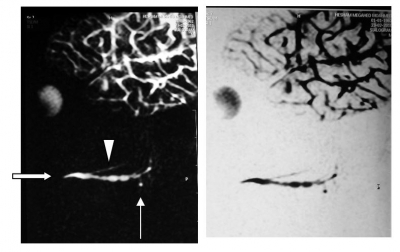 Potential disadvantages of this MR technique are usual contraindications for MR imaging (e.g., it excludes patients with pace makers and intracranial ferromagnetic clips). The technique relies on the long T2 of saliva as the basis of the contrast, and this may be shortened by proteinaceous material and debris in the presence of infection or by hemorrhage. Another potential limitation of the technique is that adjacent dental amalgam may cause image distortion. Our study, in particular, has some limitations. The main limitation is the relatively small number of patients. Our results show that MR Sialography with a heavily T2-weighted sequence is a promising diagnostic tool and carries the potential to replace invasive imaging modalities like conventional sialography in patients suspected of having sialadenitis and/or sialolithiasis. Overall, conventional sialography continues to be the standard technique for imaging of the duct system (extra- and intra-glandular). In case of difficult cannulation or if acute sialadenitis is present, an alternative imaging method is needed. In such cases, non- invasive MR Sialography provides an excellent alternative. 1. Robert L Witt. Salivary Gland Diseases: Surgical and Medical Management, 3131396113, 9783131396112, (2005). 4. 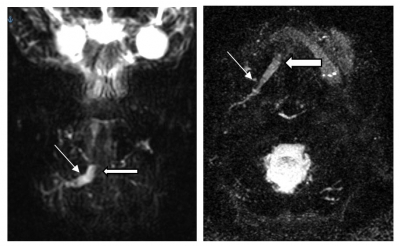 Takagi, Y., Sumi, M., Van Cauteren, M., and Nakamura, T. ‘Fast and high-resolution MR sialography using a small surface coil’, Journal of Magnetic Resonance Imaging, 22(1), pp. 29–37. doi: 10.1002/jmri.20355. (2005). 6. Lomas, D. J., Carroll, N. R., Johnson, G., Antoun, N. M., and Freer, C. E. ‘MR sialography. Work in progress’(1996). 7. Petorius P : Use of MR sialography and T2W fat suppressed MR in parotitis ; South American Journal of Radiology , Septemper (2010). 8. Gadodia A, Bhalla AS, Sharma R, Thakar A and Parchad R. MR sialography of iatrogenic sialocele: Comparison with conventional sialography, Dentomaxillofacial Radiology; 40: 147-153(2010). 9. Fischbach, R., Kugel, H., Ernst, S., Schröder, U., Brochhagen, H. G., Jungehülsing, M., and Heindel, W. ‘MR sialography: initial experience using a T2-weighted fast SE sequence’, Journal of computer assisted tomography, 21(5), pp. 826–830. doi: 10.1097/00004728-199709000-00032. (1997). 10. Ohbayashi N, Yamada I, Yoshino N and Sasaki T. Sjogren's syndrome. Comparison of assessments with MR sialography and conventional sialography. Radiology; 209: 683-688(1998). 11. Varghese JC, Thornton F, Lucey BC, Walsh M, Farrell MA and Lee MJ. A prospective comparative study of MR sialography and conventional sialography of salivary duct disease. AJR; 173: 497-503 (1999). 12. 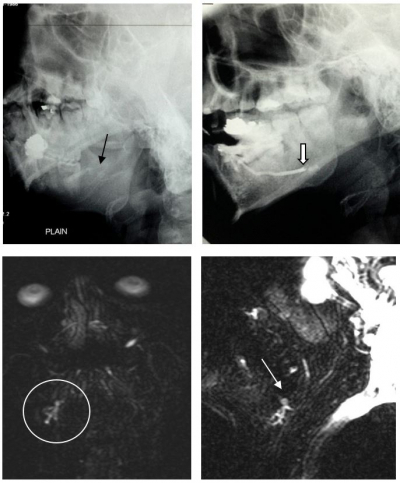 Jager L, Menauer F, Holzknecht N, Scholz V, Grevers G and Reiser M. Sialolithiasis: MR sialography of the submandibular duct - An alternative to conventional sialography and US? Radiology; 216: 665-671 (2000). 13. Morimoto Y, Habu M, Tomoyose T, Ono K, Tanaka T, Yoshioka I, et al. 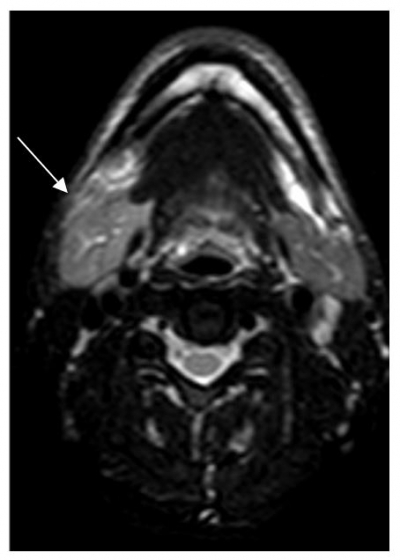 Dynamic magnetic resonance sialography as a new diagnostic technique for patients with Sjogren's syndrome. Oral Dis; 12: 408-414 (2006). 14. Hugill J, Sala E, Hollingsworth KG and Lomas DJ. MR sialography: the effect of a sialogogue and ductal occlusion in volunteers. Br J Radiol; 81 (967): 583-586 (2008). 15. Gadodia A, Bhalla AS, Sharma R, Thakar A and Parshad R, MR sialography of iatrogenic sialocele: comparison with conventional sialography. Dentomaxillofacial Radiology 40, 147-153(2011). 16. Kalk WW, Vissin KA, Spijkervet FK, Moller JM and Roodenburg JL. Morbidity from parotid sialography. Oral Surg Oral Med Oral Pathol Oral Radiol Endod; 92 (5): 572-575(2001). 17. Habermann CR, Graessner J, Cramer MC, Aldefeld D, Reitmeier F, Weiss F, Kaul MG, Petersen KU, Jaehne M and Adam G. MR sialography: optimization and evaluation of an ultra-fast sequence in parallel acquisition technique and different functional conditions of salivary glands. Rofo; 177 (4): 543-549 (2005). 18. Petridis C, Ries T, Cramer MC, Graessner J, Petersen KU, Reitmeier F, Jaehne M, Weiss F, Adam G and Habermann CR. MR sialography: Evaluation of an ultra-fast sequence in consideration of a parallel acquisition technique and different functional conditions in patiens with salivary gland diseases. Rofo; 179(2): 153-158(2007). 19. KaIinowski M, Heverhagen JT, Rehberg E, Klose KJ and Wagner HJ. Comparative study of MR sialography and digital subtraction sialography for benign salivary gland disorders. American Journal of Neuroradiology; 23: 1485-1492(2002).